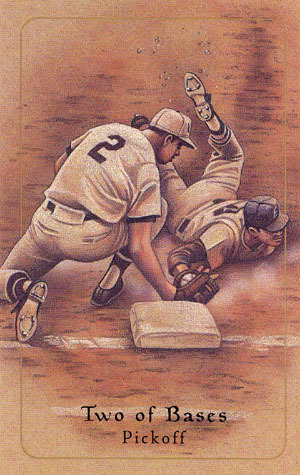 Today's Draw: The Two of Bases from the Baseball Tarot—The Pickoff. Are you juggling multiple balls? How well are you really able to focus on each? How much help do you allow yourself to receive? And are you having any fun? The Baseball Tarot is what it sounds like...a tarot deck where all the cards relate to baseball. The Two of Bases equates to the Two of Pentacles. And this deck uses the pickoff to illustrate their interpretation of the Two of Pentacles. A pickoff is when a pitcher, instead of throwing a ball to the batter, throws the ball to a baseman in an attempt to either force the base runner out or keep them closer to base so they can't steal a base. If you're a pitcher and you get a Rickey Henderson or Lou Brock on base, your hands are full. Give them an inch and they'll steal a base. And you're no longer in control. So sometimes you'll see a pitcher "check" a talented base stealer multiple times while they're on base....in addition to analyzing batters, conferring with the catcher, executing pitches and all the other stuff pitchers do. So in a theme that just won't go away, today's card is about juggling responsibilities and commitments. Recently we've been talking about clearing your plate and prioritizing things...saying no to the stuff you don't really want to do and/or doesn't really need to be done by you. So far, we've been talking about it in terms of health. But this card brings up a different motivation...to maintain focus on what's really important. The pitcher has a lot to juggle. It's his job to make sure as few base runners as possible cross home plate. That singular focus has many facets and responsibilities. The pitcher's not alone in this. He's in partnership with the catcher (who can also pickoff a base runner, btw). And he relies on all the other basemen to one degree or another. But in the end, the buck does stop with him. It's his stats that will suffer. (A pitcher's earned run average or ERA is one of the most definitive player statistics in the game, along with career wins and strikeouts.) It would severely affect his performance if he had to also be the ball boy and bat boy, team manager, pitching coach, batting coach, groundskeeper, etc. But isn't that what a lot of you do in your daily lives? Another facet of dropping the droppable in order to tighten your focus is the Willie Stargell quote that went along with this card: "The umpires always say 'play ball'. They don't say 'work ball'." By getting rid of the crap that leeches your energy and soul, life becomes that much more like play. Sure, responsibilities will always be responsibilities. But that doesn't mean you can't enjoy them. So consider today's input as you continue your spring cleaning of your "to do's". And ask yourself whether you'd rather do a few things really well and with your full attention...or would you rather do a bazillion things, most of which are completed sufficiently enough, but nonetheless leave you walking around in a haze all the time? For the fans...while I was googling around on this entry, I found that Steve Carlton, holds the record for pickoffs at 144 over a 23-year career, which shows how hard it is to pick off a batter. Interestingly, or perhaps obviously, he's also the career record holder for balks. So while he is certainly one of baseball's all-time best pitchers, winning four Cy Young awards, he was especially scary to the Lou Brocks of the world, keeping them tightly in check. I used to be a big baseball fan, so I'm certain I've seen Carleton vs Brock before. But I never appreciated it until now. Since they were in different leagues, Carleton never had a chance to go up against the Rickey Henderson, the all-time base stealing champion.